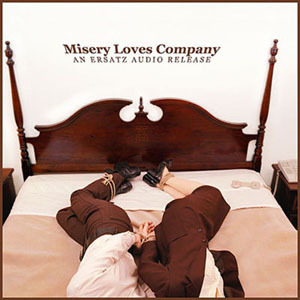 Misery Loves Company: An Ersatz Audio Release. All songs new and exclusive to this release. PIG, CAT & Co.W "Car Starter"
PIG, CAT & Co.W are, (PIG: Khan) NYC, USA / (CAT: Electronicat) Paris, France / (Co.W: Mingo-go) Glasgow, Scotland. This is the first released song by PIG, CAT & Co.W. They have a full length coming out in the future on an undisclosed label. The song "Car Starter" is on the CD version of this compilation as a bonus track. Kitbuilders are from Köln, Germany. Kitbuilders own Vertical Records. Kitbuilders have released music on Vertical Records, Breakin' Records, World Electric, etc. G.D.Luxxe is from Vienna, Austria. G.D.Luxxe is the owner of Angelika Köhlermann. G.D.Luxxe has released music on Cheap Records, Breakin' Records, Mego, etc. Magas is from Chicago, USA. Magas is co-owner of the shop Weekend Records and Soap. Magas has released music on Ersatz Audio, etc. Adult. is from Detroit, USA. Adult. own Ersatz Audio. Adult. has released music on Ersatz Audio, Clone Records, etc. SOLVENT & SKANFROM "Expect Delays"
Solvent is from Toronto, Canada. Solvent is co-owner of Suction Records. Solvent has released music on Suction Records, Morr Music, etc. Skanfrom is from Berlin, Germany. Skanfrom is owner of A.D.S.R. Skanfrom has released music on A.D.S.R., Suction Records, Morr Music, etc. TAMION 12 INCH "Thin Boys Murdered"
Tamion 12 Inch is from Detroit, USA. This is the first released song by Tamion 12 Inch. Ersatz Audio will be putting out a 12" of Tamion 12 Inch winter 2002. DMX Krew is from London, UK. DMX Krew is the owner of Breakin' Records. DMX Krew has released music on Breakin' Records, Rephlex, International Deejay Gigolo, etc. The song "Touch Me!" is not included on the vinyl version of this compilation because it will be released fall 2002 on a 12" on Ersatz Audio. Lowfish is from Toronto, Canada. Lowfish is co-owner of Suction Records. Lowfish has released music on Suction Records, Morr Music, Centre City Offices, Ersatz Audio, etc. CHARLES MANIER "Out Like A Tooth"
Charles Manier is from Ann Arbor, USA. Charles Manier has released music on Ghostly International. Goudron is from Detroit, USA. This is the first released song by Goudron. Ersatz Audio will be putting out a 12" of Goudron fall 2002. GOLD CHAINS w/ Zeek Sheck "Could Care Less"
Gold Chains is from San Francisco, USA. Gold Chains has released music on Orthlorng Musork, etc. The song "Could Care Less" inspired Ersatz Audio to create this compilation. TOMMIE SUNSHINE "Runway Runaway for kelly"
Tommie Sunshine is from Chicago, USA. Tommie Sunshine is the owner of xylophone jones. This is the first released song by Tommie Sunshine. Tommie Sunshine has released music in collaboration with Felix Da Housecat, Binge & Purge, Jackass & Mule, etc. "Misery Loves Company stands apart from anything else around right now. The new wave of the new wave, and it's superb."